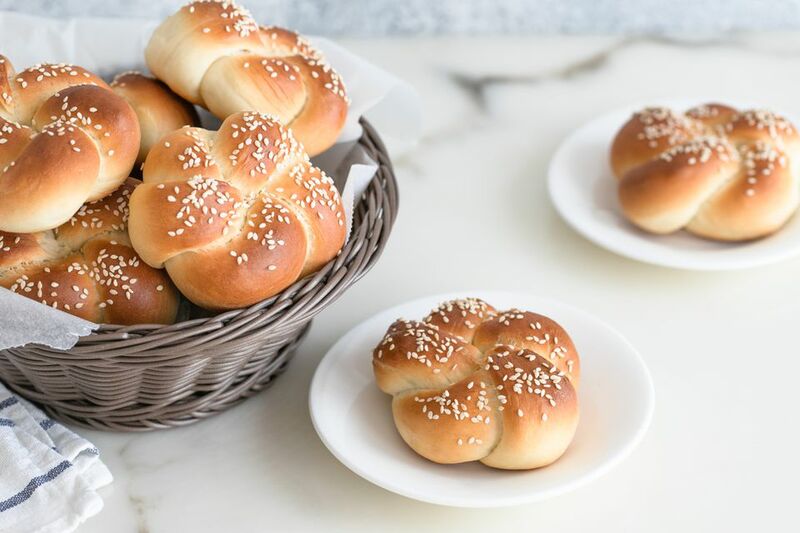 These kaiser rolls are shaped by making a knot and looping the dough around the circle. Another way to shape the rolls is with a kaiser roll stamp. Finish these rolls with an egg wash and sesame seeds, or leave them plain or top them with poppy seeds. Combine the water and yeast in the bowl of a stand mixer; let stand for 10 minutes. Add 2 cups of flour and beat until smooth. Switch to the dough hook and add the remaining flour, milk powder, sugar, salt, 3 tablespoons of butter, and the beaten egg. Mix on medium speed for about 6 minutes. If too soft or too stiff, add more flour or water, about 1/2 to 1 teaspoon at a time, or until the dough is soft yet pulls away from the sides of the bowl. If you are not using a mixer, mix well with a wooden spoon and knead by hand on a lightly floured surface for about 10 minutes, until smooth and elastic. Oil a large bowl. Gather the dough into a ball and place in the bowl. Turn to coat all sides with the oil. Cover with plastic wrap and let rise in a warm, draft-free place for about 1 hour, or until doubled in bulk. Portion the dough into 2- to 3-ounce pieces, depending on how big you want the rolls. On a lightly floured surface, roll a piece of dough into a rope about 12 to 15 inches in length. Grasp both ends and make a simple, loose overhand knot with the rope, leaving a bit of space in the middle and two long tails of dough. Take each tail of dough and wrap loosely around the loop part of the dough, pinching the ends together on the bottom. This will form the "knot." Repeat with the remaining dough pieces. Arrange the rolls on a large baking sheet lined with parchment paper. Cover loosely with plastic wrap or clean kitchen towels and let rise at room temperature for about 1 hour. Make an egg wash with 1 egg white beaten with 1 teaspoon of water. Brush over the rolls and sprinkle with sesame seeds or poppy seeds, if desired. Or, simply brush a little melted butter over the tops before or after baking. Bake the rolls in the preheated oven for 15 to 18 minutes, until golden brown. Use for your sandwich or burgers and enjoy!